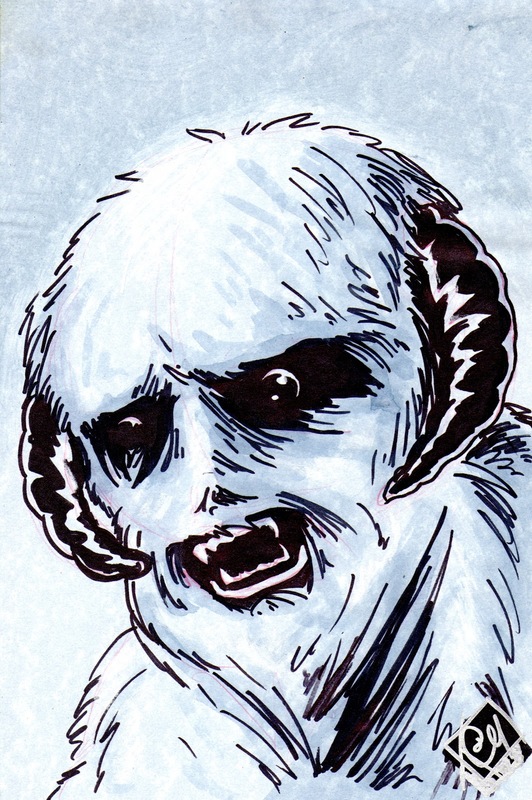 Taylor's Sweet Little Art and Nerd Site: Furry Friday- The Wampa Ice Creature! No cute kittens, puppies, or baby sloths today. Instead I bring you a fuzzy creature from the sixth planet in the Hoth system, the Wampa (ice creature). Here's what wookieepedia has to say about Wampas. Wampa ice creatures were carnivorous predatory reptomammals indigenous to the remote Outer Rim Territories ice planet Hoth. The bipedal beasts stood over two meters in height with shaggy white fur constantly stained by the blood and guts of slaughtered prey. Wampas were armed with jagged yellow teeth and deadly claws. Primarily solitary hunters, wampas occasionally hunted in packs, preferring to ambush their prey from the camouflage of Hoth's snow banks and blizzards. Stunned victims were carried back to the creatures' lairs, typically large ice caves, where the wampas ate at their leisure. The planet's omnivorous tauntauns formed the bulk of the wampas' prey, although they would attack anything they encountered. The Alliance to Restore the Republic's Echo Base on Hoth came under constant wampa assaults in 3 ABY. While rarely seen away from their remote homeworld, wampas were known to have participated in illegal gladiatorial combat venues. They were highly valued among big-game hunters for the challenge that came with hunting the creatures, as well as for their pelts, stuffed heads, and other miscellaneous souvenirs that commanded high prices on the black market. 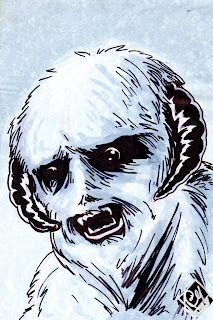 Wampas were later protected under legislation to prevent endangered species from falling into extinction by the Galactic Federation of Free Alliances. This was a commission piece I did for a good friend of mine, Brynna, who you can hear on the fun podcast, "The Loosely Based". When I was searching for pictures of the Wampa, I had the hardest time finding one specific look. Fan art, Comics, and movie set stills all kind of change the look a little. At first I wondered why that was, then the answer came to me; the dude's covered in thick white hair on an ice planet. It's going to hard to see what he looks like. So, my Wampa might be "off" a lilttle, but hopefully you still enjoy it! You can also see this art piece here.